A Chrysiptera taupou in captivity. I have a 55 gallon tank with a mated pair of percula clown fish, a red flame hawk fish, and a coral beauty angel. I would like to add 3 yellow tailed blue damsels. Am I likely to create an aggression problem? these displays to the Cleaner Shrimp, to certain sections of rock, and to all the fish. I’ve watched a long time from a distance the last two days and I’ve never seen it actually attack anything, but it harasses the other fish until they finally bite it. The rear fin is a little tattered, but there hasn’t been any serious damage. I’m very confused. Can you offer any opinions on this behavioral shift? I find it odd that this fish is picking fights, but not throwing any blows. The Damsel’s swimming is quick, jerky, erratic, sometimes spastic like twitching, and raises it’s fins when bothering the other fish. The only other change I can think of is that the Damsel is now eating the Nori that I now feed the tank. So, the fish’s diet is a little different. Did vegetables drive this fish crazy? you so much for the quick response. I apologize for leaving the subject line blank and leaving out the scientific. (Chrysiptera cyanea) I typed in word and copy pasted to email and I sometimes forget the subject when I do that. Sorry to bug you with such a trite question, but I was hoping you could lend a little knowledge on a quick compatibility quandary. My neighbor is breaking down his tank and has offered me some livestock. The only fish I'm interested in would be his Starcki's Damsel (Chrysiptera starcki). I've observed it in his tank for the better part of a year and never seen anything aggressive from him, and it is my understanding that Starki's are more mild than most other damsels. I would be adding him to my 150g reef, but I'm worried that he would be aggressive toward my Royal gramma (Gramma loreto) due to color/pattern similarities and both fish potentially being territorial. What are your thoughts? <I have three Starcki Damsels and a Gramma in a four foot ninety gallon. I have attached a picture <<Someone else's work>> of a damsel I have seen a few times in the past and today in my LFS here in the UK. It was labeled as a tricolour damsel, Chrysiptera rollandi . and confusingly, photo's on the web show fish like the one I seen today and others which are dissimilar under the same name. Is this the juvenile form of Chrysiptera rollandi, or a variant? <Ah, welcome. If you think some of the Pomacentrids are confusing in this coloration matter, take a look at the Labrids! I would like to keep the following in a 220 gallon tank. The tank will have lots of live rock, hiding places and broken sight lines. The Blennies would be introduced first, the Damsels second and the Dwarf Angels last. The question I have is; How aggressive will the Chrysiptera springeri be in this setup? I have read conflicting reports about this damsel's peacefulness or aggression. 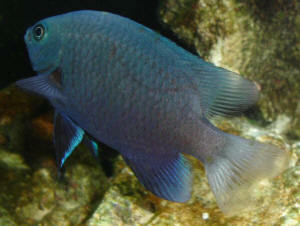 Does anyone have direct experience with a small group of these damsels kept in a larger aquarium? First I would like to say thanks for a wonderful site! But now for the question. I saw two Chrysiptera Rollandi at my LFS, and would like to know if they could successfully live in a 35 Gal tank? I just want to know if one would bully the other. (got them last Wednesday, so it's been a week). I want to check on what the pet store said which was that what MIGHT happen is the bully will become the female and they will become a mated pair. So one question I have is that if this does not happen, should I remove one of the fish? Thanks for the response, that's too bad. Well, if I'm going to move one out anyway, the one that gets bullied has some discoloration on his lips. I didn't notice it in the pet store, but I did right after putting him in the tank. They seem more clear then white, but the pics show up white. There is also slight white around both eyes that was not there before. If you think it's a disease I'll take him out now, but the pet store thought it was an injury, so I've just been waiting for it to heal. Thanks. Hello again, I was hoping to give an update saying that all is well with my poor yellow tail damsel, but he stopped eating two days ago, and this morning I noticed a small red spot on his puffy lips (which seem to be a little puffier also) sort of like they are cracking open. rather than give him to the pet store (kind of a way to let him die peacefully without even more stress of being recaptured and moved). Also, I was going to move him to a 10gal refugium once I got that set up to stop the bulling, but now I'm wondering if this will turn to some sort of disease that will contaminate my tank, and should I just net him and flush the poor fellow? Oh, and I also have some isopods, letting you know in case they might be making the blood spot. Thanks, Paul. Well, I'm saddened. Is it worth trying to give him away or take him back to the pet store? My guess is no, but I'd rather him not die if there was hope for that. I guess the lesson I learned this time is to listen to sound advice! Thanks again. You, of course, were right, and the injured and harassed yellow tail damsel died. So a couple of weeks went by and I bought a Talbot damsel as you thought a Talbot might be un-harassed by the bully. I even bought 2 more rocks and mixed everything up to disturb his territory, but alas, he seems to just like to harass other fish. The Talbot is usually under that rock (shown in the picture) and even there the yellow tail finds the hiding fish a chases him out of there. We got the Talbot on Monday ('tis now Thursday) and just wanted your thoughts. My wife thinks I should give them more time to become friends, but I doubt that's possible now. Thanks. I was wondering if I would be able to add three Yellowtail Damsels (Chrysiptera parasema) to my tank. 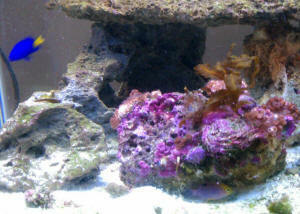 Current setup is 75 gallon soft coral tank, running two 175 watt metal halide lights, on for 8 hours a day. Two 110 watt VHO 454 Actinics, on for 12 hours. 15 gallon sump with a Mag 9 for return, Aqua C EV-180 protein skimmer with Mag 7. Two Maxi-Jet 600 and one Maxi-Jet 900 for added circulation in tank, with 85 pounds Fiji live rock and 4 inch sand bed. I run Activated Carbine changed out monthly and do 10% water changes weekly. Tank has been running for little over a year now, with zero Ammonia, Nitrite, Nitrate, and a Ph of 8.2-8.4. For corals I have two Branching Sinularias, two Toadstool Leathers, a Red Colt, Green Star Polyp, and Neon Centered Clove Polyps. For inverts I have two Skunk Cleaner Shrimp, 5-10 Astrea Snails, 5-10 Cerith Snails, 5-10 Nassarius Snails, and a sand sifting Sea Cucumber. For Fish I have two Clownfish True Percula (Amphiprion percula), two Banggai Cardinals (Pterapogon kauderni), a Coral Beauty (Centropyge bispinosus), and a Clown Fairy Wrasse (Cirrhilabrus solorensis). All fish were quarantined a month before adding, and are getting along great. The Yellowtails would be the last fish in the tank. I am just looking to add a little more color and I love the blue and yellow combo. If the Yellowtails are too mean for my tank then I could add a Royal Gramma, which would add the same color effect. There just not as active. <I do think these would be a nice addition Jaime. Color, behavior-wise. Thanks so much for your fast response. One more question I forgot to ask, would it be alright to quarantine all three yellowtails in a 10 gallon bare bottom tank? I know in tight quarters they might fight with each other. I do have a 20 long that is just laying around I could use if the 10 is not big enough, it just takes a little more energy to heat and the bill is already high. Thanks again for your time, the fact that you and the crew donate your time on all these questions is amazing. I have a 105 gallon reef tank filled with lots of soft corals and a few LPS corals that is currently populated by 1 black Ocellaris Clownfish, 1 Green Chromis, 1 Midas Blenny, 1 Banggai Cardinal and 1 Blackfin Dartfish. The tank has been up and running for more than 1 year and the Black Dartfish was the last one I purchased and has been in the tank for more then 3 months. I've been looking for a reef safe fish that stay's relatively small and has that eye-popping blue that so few fish possess. If not for they're dubious reputation regarding corals, Centropyge argi would have been my first choice. Would it be OK to introduce 1 Chrysiptera Parasema into my aquarium? Sometime in the future ( when one of the LFS has one for sale ) I would like to complete my setup with 1 Serranus tortugarum and 1 Synchiropus picturatus ( if I can find a nice fat one that's at least willing to eat some frozen food ). <Yes, the Mandarin can be difficult to acclimate to prepared foods. Would be a good idea to introduce some live pods in the tank and introduce the Mandarin a few months later. 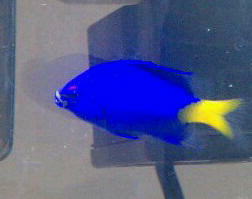 Should I wait until I have purchased all the other fish on my wish list and introduce the Damselfish last? Thanks for the quick reply ( had some internet provider problems , so I could not read your reply till today ). Would 1 yellow tail Damsel be best in this setup or would a group of 3 or 5 be better? this reasonable, or would it create problems either for the existing or new inhabitants? Thank you again Mike. Will put all your suggestions into practice. One last question for you. Any idea what kind of damsel this is (see attached picture)? It came with my tank, previous owner had no idea what it was. It's color changes from a dark blue/purple to a washed out various of the same as it swims around the tank. Very personable, busy fish. Has staked out it's corner of the tank and is otherwise very tolerant of the two pesky Sgt. Majors and isn't concerned at all with the Cardinals. <Really need some more information to even attempt an identification better than a guess. Information like size and how long one has had the fish is helpful. Many damsels change their colors as they mature. If one were to force me to make an ID, my best guess would be a member of the Neoglyphidodon genus that is in the process of color changing. It does do something odd with the eel. I've noticed several times when the eel sticks it's head up out of the rock at the back of the tank the Damsel will swim over, invert its self so it's head is pointed straight up towards the top of the tank and then stay there by the eel. Sometimes still, sometimes 'wagging' it's hind end. I assume this is some sort of posturing, but it doesn't seem real aggressive. The eel isn't bothered by it at all! I sure wish I knew someone like you locally. I have *so* many questions. I had no idea damsels could color morph so amazingly. Sadly, I don't have much background info on the fish. It came with the tank when I bought it and the precious owner didn't know what it was either. Which kinda stymies me. I've been obsessively cataloging and identifying everything large and small living in my tank. - in the tank the color of the fish changes pretty dramatically as it swims. Sometimes it looks very vivid (like in the picture), sometimes it looks like a washed out version of the same colors. Just depends on how the light hits it. Not much to go on. I suppose specific ID isn't critically important, but I do like knowing what I have when possible! If I may impose one last time - will a single canary demoiselle thrive or is it best to keep them in a small group? Should they be added before or after a flame angel? I was given my first saltwater aquarium a few weeks ago, with fish by a friend. She went bigger and gave me the fish that came with her tank bigger tank. I have identified all the fish in the tank except for this one. I was finally able to get a couple of good clear photos of it and have attached them to this email. It is approximately 2-2 1/2 inches long and is always these muted colors. So I was in a LFS the other day getting a ballast (never fun) and mentioned to the SW guy named Andy (Pets Inc. in Tempe AZ) that I had a small infestation of Flatworms for about 6 months now. He pointed me to this tank with 2 damsels in it. Says that these blue "Damsels" will eat them, they are not the regular blue damsels. SURE I said, but decided to take him home and give it a shot. Well its been about a month now and he gets along GREAT with my female Picasso clown (who is a real you know what) and there is no sign whatsoever of Flatworms. CRAZY. So I thought I would send this to you, for your posting pleasure on WWM and maybe you can ID the damsel, maybe just a common blue damsel? Anyway Enjoy and will talk soon!!! 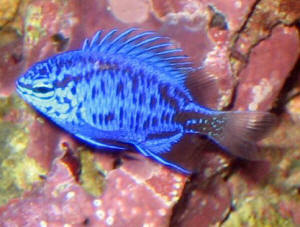 Re: Yellowtail Damselfish I have a problem with both my damsels. One keeps attacking the other one. <Very typical with many species of Damselfishes... territorial generally. Sometimes keeping them in odd numbers lessens the damage to just one in "even number" settings. You might try adding another individual if there's room, placing more habitat (e.g. live rock)... otherwise it would be prudent to remove the one getting beaten> I would like to keep one of them, but would like to get another fish. Do you have any suggestions? I started my tank only 2 weeks ago. <Please read through the "Livestocking" sections on our site: WetWebMedia.com ... There is much "going back and forth" we'd have to go through to inform you. For instance, you provide little information on how large your system is, its make-up... All important factors in such determinations> Oh yeah, this might be a silly question, but is it dangerous if a fish mates with other species within the same genus? <Dangerous? No. Generally will not result in viable offspring. Bob Fenner> Thank you.